Paris: Le Soleil Noir, 1953. Cloth. Near Fine/Near Fine. 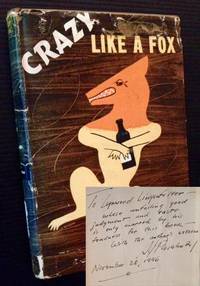 1953 1st edition of this playful use of collage by attaching the head of one person to the body of another. Clean and Near Fine in a crisp, price-intact, Near Fine dustjacket, with very light creasing to the rear panel. 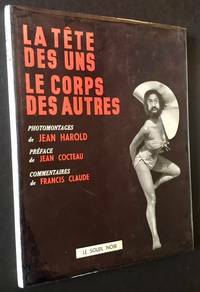 Quarto, the photomontages by Jean Harold, the captions by Francis Claude and the Preface by the formidable Jean Cocteau. Caldwell, Idaho: Caxton Printers, 1938. Boards. Near Fine/Very Good. Nick Villeneuve. 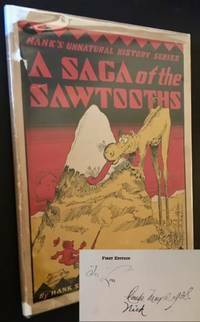 The uncommon 1938 stated 1st edition of this nonsensical guide to the mythical creatures of the Sawtooth Mountains. 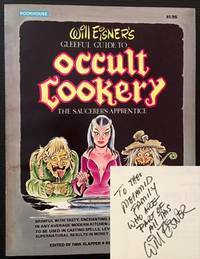 THIS COPY IS SIGNED BY BOTH THE AUTHOR HANK SENGER AND THE ILLUSTRATOR NICK VILLENEUVE on the title page. Tight and Near Fine in a crisp, VG dustjacket, with light chipping at the spine ends and along the panel edges. Still though, very presentable. Text in rhyme by Hank Senger. Featuring full page and smaller black-and-white lithographs by Nick Velleneuve showing a bevy of Seuss-like unanimals such as the Mugwump, the Whangdoodle, the Whizzer Snifter and others. A clear, early imitation of --and tribute to-- the wonderful creations of Dr. Seuss. The Fantod Press (Distributed by Gotham Book Mart), 1971. Original wraps. Fine. Edward Gorey. 2 of the 3 1971 books packaged and offered together by The Fanrod Press. Here we have "The Eleventh Episode" and "(The Untitled Book)" but are missing "The Dranged Cousins". 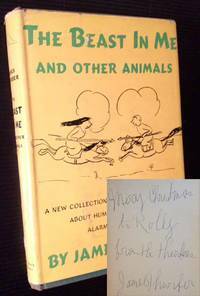 The 2 books offered are BOTH SIGNED BY EDWARD GOREY (as one of his characters) and are in pristine condition. Both are bright and Fine in their stapled, pictorial wrappers. 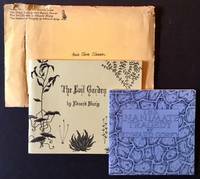 INCLUDED WITH THEM IS A CRISP, NEAR MINT COPY OF THE PUBLISHER'S PRINTED MAILING ENVELOPE (which clearly accounts for the superb condition of the 2 books). New York: The Fantod Press, 1966. Original wraps. Fine. Edward Gorey. 2 of the 3 1966 books packaged and offered together by The Fanrod Press (its maiden effort in this wonderful series). Here we have "The Evil Garden" and "The Inanimate Tragedy" but are missing "The Pious Infant". The 2 books offered are in pristine condition. Both are bright and Fine in their stapled, pictorial wrappers. INCLUDED WITH THEM IS THE PUBLISHER'S PRINTED MAILING ENVELOPE. It shows some creasing and light tears and chips along the edges but clearly accounts for the superb condition of the 2 books. Garden City, NY: Doubleday and Company, Inc, 1970. Hardcover. Near Fine/Very Good +. 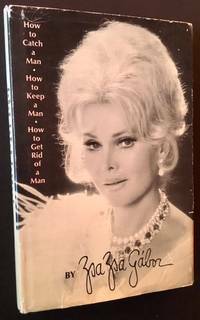 The 1970 1st edition of this priceless collection of advice about men and love from Zsa Zsa Gabor. A tight, Near Fine octavo in its decorative boards. And in a crisp, price-intact ($4.50), VG dustjacket, with light wear at the flap-folds, just a touch of creasing and wear along the panel edges, and very light soiling to the rear panel. A solid, very presentable copy. New York: Milrose Publishing Co, 1943. Original wraps. Very Good +. 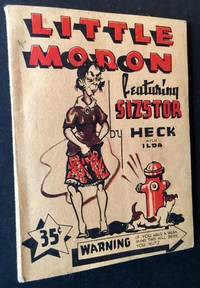 The 1943 1st edition. Solid and VG+ in its raunchy pictorial wrappers, with just a touch of light soiling to the panels. 16mo, wild black-and-white illustrations thruout featuring Little Moron and his Siztor. New York: Harper & Brothers, 1898. Hardcover. Very Good -. A.B. Frost. 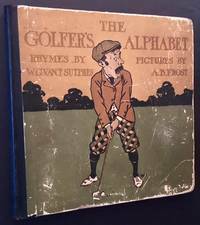 Charming golf alphabet book, humorously --and sympathetically-- "rhymed" by W.G. Van T. Sutphen and wonderfully illustrated by A.B. Frost. Tight and VG- in its pictorial boards, with the level of scuffing and rubbing along the panels and panel edges one might expect from a 120 year old book. Still though, solid and very presentable. Square octavo, Frost's magnificent line drawings accompanying each letter of the alphabet. KIngston, Jamaica: Palm Tree Production, 1978. Original wraps. Near Fine. The very uncommon maiden issue of this scarce late 70s/early 80s Jamaican humor magazine. Tight and Near Fine in its stapled, pictorial wrappers. Octavo, high-quality cartoons firmly rooted in the Jamaican social and political issues of the day. New York: G.P. Putnam's Sons, 1972. Hardcover. Near Fine/Near Fine. 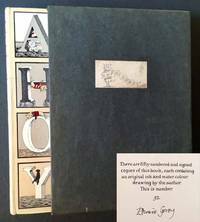 The 1972 signed/limited edition, #32 OF 50 COPIES SIGNED BY EDWARD GOREY at the limitation. This edition calls for "an original ink and water colour drawing by the author", which this copy lacks. Still though, very scarce as such and a lovely copy to boot. Tight and Near Fine in its laminate boards. And in a crisp, price-intact, Near Fine dustjacket, with a tiny chip at the rear panel's top-edge and a miniscule closed tear to the front panel's lower-edge. Quarto, internally immaculate, with no writing or markings of any kind. Also includes a sturdy, VG example (light soiling to the title label and along the rear panel) of the publisher's printed slipcase, which has clearly protected the book and dustjacket very well. New York: Random House, 1978. Cloth. Near Fine/Very Good +. 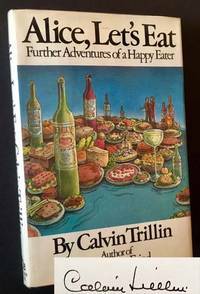 SIGNED BY CALVIN TRILLIN on the title page. A very sharp copy to boot of the 1978 stated 1st edition. Tight and Near Fine (just a touch of offsetting to the top-edges) in a crisp, price-intact, VG+ dustjacket, with very light creasing --and mild darkening-- along the top-edges. Octavo, 182 pgs. New York: Simon and Schuster, 1931. Cloth. Very Good/Very Good. Otto Soglow. 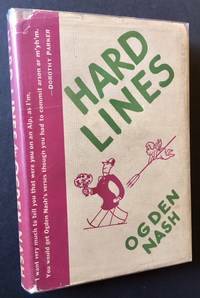 The 1931 1st edition of Ogden Nash's first published book. Solid and VG in a crisp, price-intact, VG dustjacket, with light chipping at the spine ends, light creasing along the panel edges and one inconspicuous closed tear to the rear panel. 12mo, illustrated by the great Otto Soglow (of "The New Yorker" fame). New York: Henry Holt, 1960. Cloth. Fine/Very Good +. Roy Doty. A very sharp copy of the 1960 1st edition. Tight and Fine in a bright, price-clipped, VG+ dustjacket. Octavo, illustrated thruout by Roy Doty. New York: A.S. barnes & Company, 1907. Cloth. Very Good. Robert A. Graef. 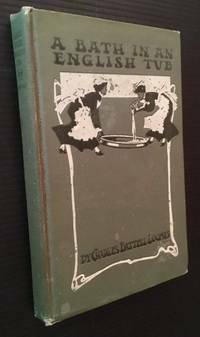 The 1907 1st edition. Solid and VG in its green pictorial cloth, with light soiling to the front panel and light rubbing along the spine. 16mo, nicely illustrated by Robert A. Graef. Paris: Librairie d' Amateurs, 1951. Original wraps. Near Fine/Very Good +. Dubout. The 1951 1st thus, a wonderful --and ribald-- series of illustrations by Debout "supplementing" the text. Clean and Near Fine in its pictorial wrappers, with just a touch of wear at the spine crown. Also includes a VG+ example of the glassine dustjacket, with light chipping to the spine ends. Quarto, the 90 color illustrations by Debout upstaging Erasmus's text, which is here translated from the Latin into French by De Laveaux. New York: Poorhouse Press (Harmony Books), 1974. Original wraps. Very Good +. Will Eisner. WARMLY INSCRIBED BY WILL EISNER on the title page. A solid copy to boot of the 1974 1st edition. Tight and VG+ in its pictorial wrappers, with light soiling along the spine and light creasing to the lower front tip. Quarto, wonderfully illustrated thruout. New York: Poorhouse Press Book (Harmony Books), 1974. Original wraps. Very Good. 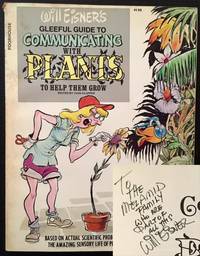 WARMLY INSCRIBED BY WILL EISNER on the title page. A solid copy to boot of the 1974 1st edition. Tight and VG in its pictorial wrappers, with pronounced foxing along the spine and light wear at the spine crown. Quarto, wonderfully illustrated thruout. New York: Frederick A. Stokes Company, 1939. Cloth. Very Good/Very Good. 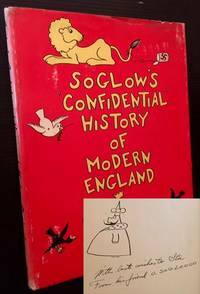 INSCRIBED BY OTTO SOGLOW AND ALSO INCLUDES AN ORIGINAL DRAWING OF THE "LITTLE KING" JUST ABOVE HIS SIGNATURE on the front free endpaper. 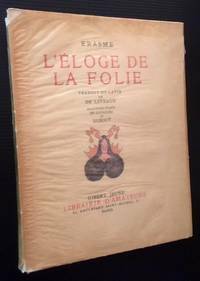 A solid copy to boot of the 1939 1st edition. Tight and VG (light scuffing to the boards, small, neat former owner inscription at the front free endpaper) in a bright, price-clipped, VG dustjacket, with staining along the rear panel's top-edge and light rubbing at the front panel. Quarto, wonderfully illustrated thruout by one of the great "New Yorker" cartoonists in the magazine's illustrious history. Garden City, NY: Garden City Publishing, 1945. Boards. Very Good/Good +. 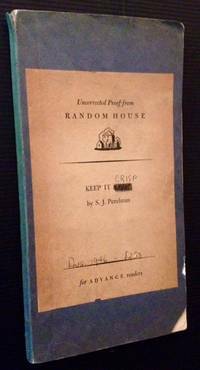 WONDERFULLY INSCRIBED BY S.J. PERELMAN on the front free endpaper. A presentable copy to boot of this 1945 Garden City re-issue. Solid and VG (light bumping to the tips, former owner bookplate at the frontispiece) in a presentable, Good+ dustjacket, with pronouced tape at the rear panel edges and light wear and creasing overall along the edges. (Curiously, Perleman himself seems to have taped his own handmade name and address label to the foot of the front flap, further making this a one-of-a-kind copy ). 12mo, 269 pgs. New York: Random House, 1946. Original wraps. Very Good. Random House's uncommon August 1946 Uncorrected Proof, with its wonderful cover designed only for the Proof copy. Solid and VG in its light-blue wrappers, with light chipping along the panel edges and tips, and one 2 1/2"chip at the rare panel's lower-edge. Still though, very presentable. Quarto, occasional editorial pencil underlining. New York: Harcourt Brace and Company, 1948. Cloth. Very Good/Very Good. James Thurber. A FULL-PAGE INSCRIPTION FROM JAMES THURBER on the front free endpaper. 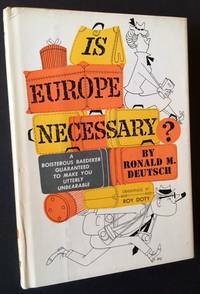 A solid copy to boot of the 1948 stated 1st edition. Tight and VG (with mild sunning at the spine ends) in a bright, price-clipped, slightly-cropped dustjacket, with very light soiling to the panels. Octavo, illustrated by the author himself. "A New Collection of Pieces and Drawings About Human Beings and Less Alarming Creatures"